GoCardless is a UK based Direct Debit provider. Integrating GoCardless with Zoho Books enables you to easily collect one-off or recurring invoices via Direct Debit - putting you in control of your cashflow. 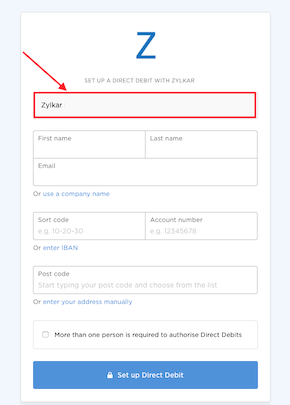 Your customers will be able to set up the Direct Debit mandate and pay the invoices that you send using the link in the email or through the client portal. To accept direct debit payments with GoCardless you must have a GBP/EUR bank account connected with your GoCardless account. 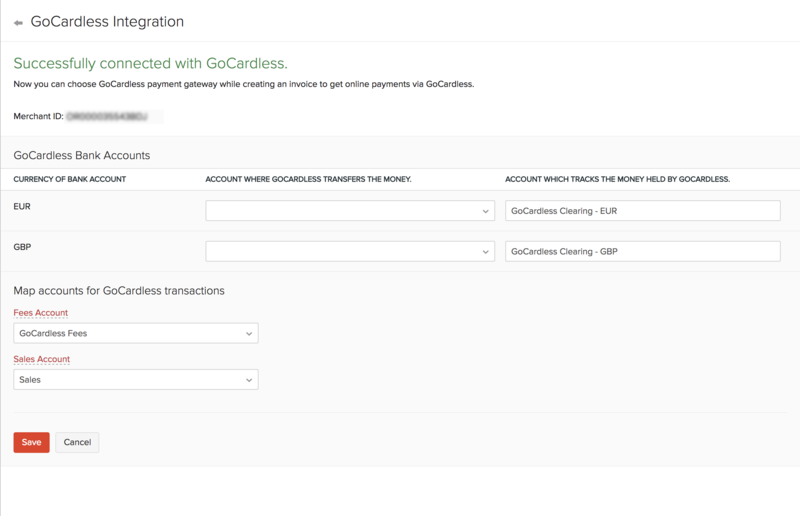 Integrating Zoho Books with GoCardless will let you accept payments in GBP. But, to register for SEPA(Single Euro Payments Area) and to accept payments in Euro, you will have to contact GoCardless. 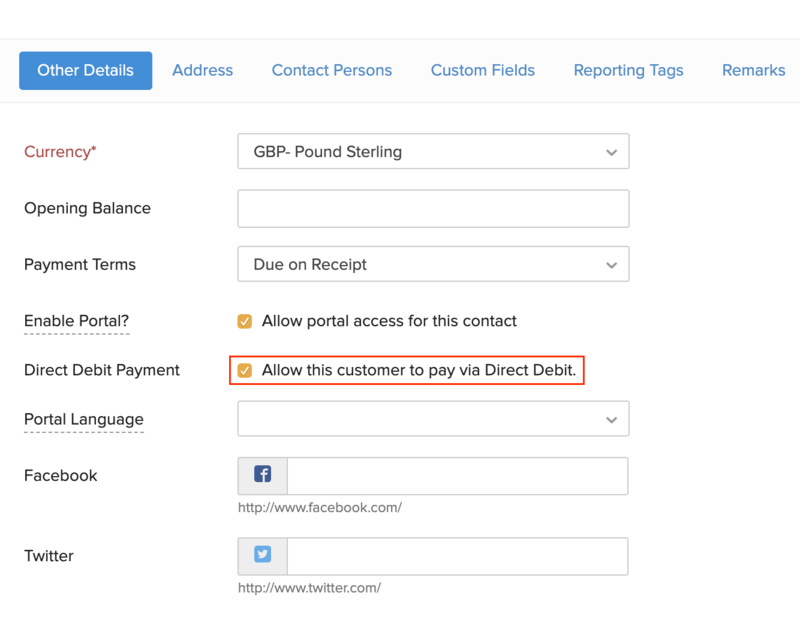 In order for customers to be able to pay via GoCardless, you need to enable Allow this customer to pay via Direct Debit option for your customers in the Other Details section of the contact creation/edit page. It will take 3-5 days to process a transaction. The minimum transaction amount is £1 and the maximum transaction amount is £5,000. To increase this limit, you can contact GoCardless. Click the Gear icon found on the top-right corner of the window and select Integrations. 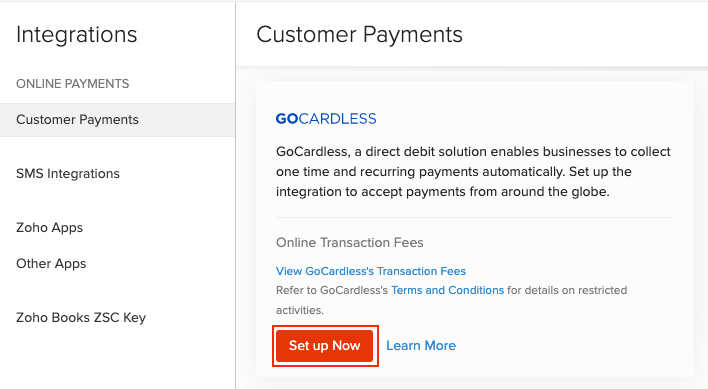 Select Online Payments and click the Setup GoCardless button, listed below the GoCardless’s logo. 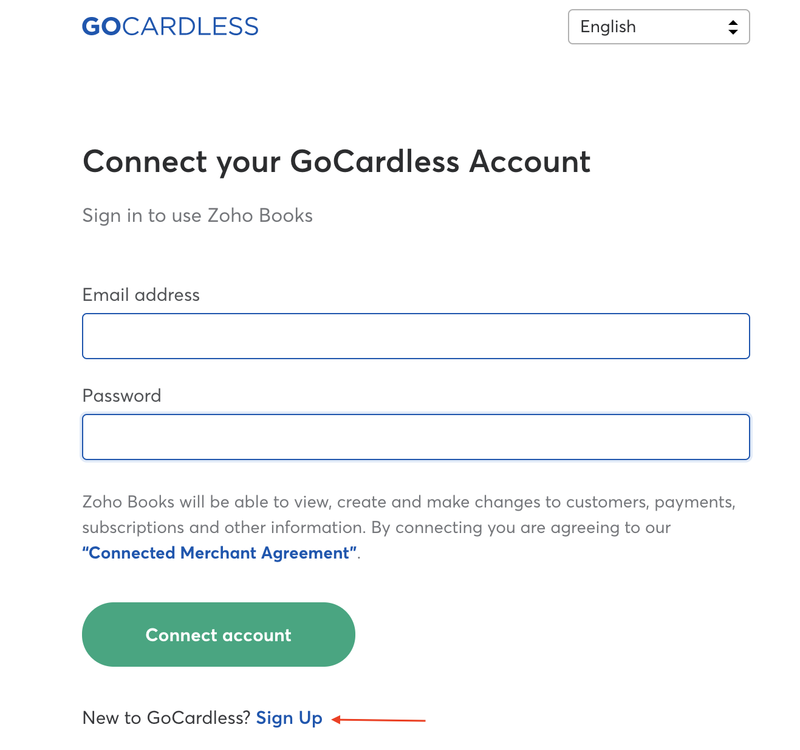 In the following screen, enter your email and password registered with GoCardless and click Connect your GoCardless account. 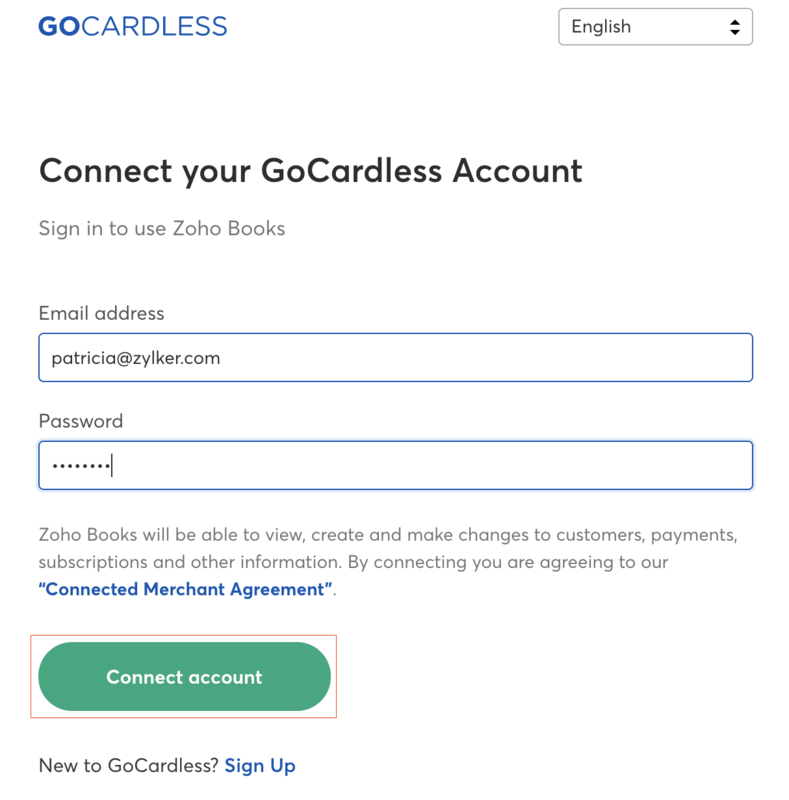 In the following screen, you can create a new GoCardless account by clicking on the Sign Up button. 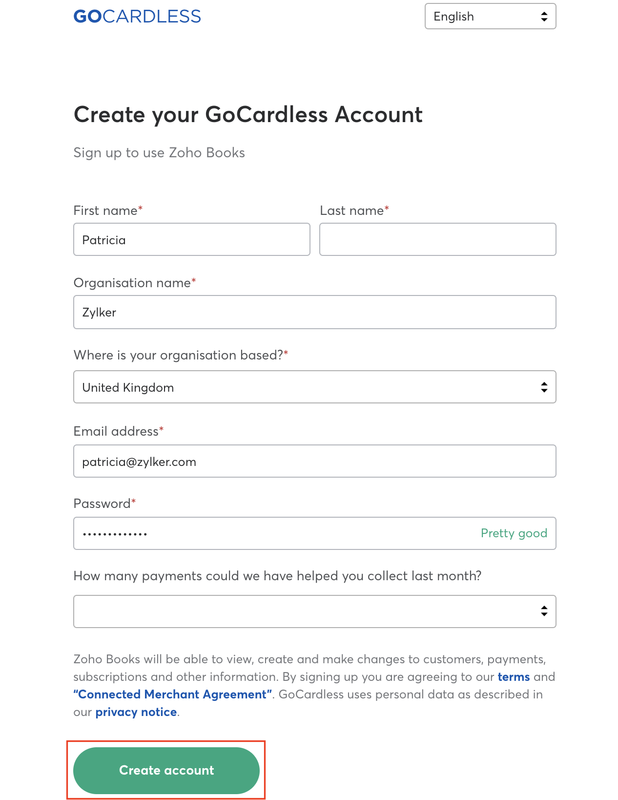 Enter your name, organisation name, email and password and click Connect your GoCardless account. You will receive a verification email from GoCardless. To verify your account, sign in to your GoCardless account using the link provided in the email. Once signed in, select Settings in the top-right corner and select Company Info. 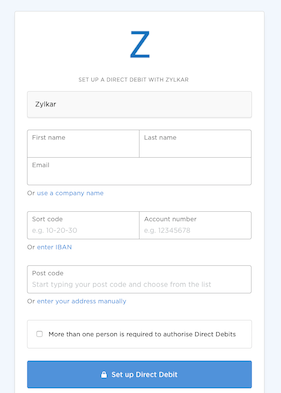 In the following page, fill in your company information and the bank account details you would like to send/receive payments. Click the Gear icon on the top-right corner and select Integrations. Navigate to the Online Payments tab and click the Preferences button under GoCardless. You will be able to edit the Mandate Description in the pop-up. Note: Your organisation’s name will be displayed by default if no Mandate Description is given. Direct debit sync in GoCardless allows you to fetch your customers’ mandate details from your GoCardless account to your Zoho Books account. The primary email ID of your customer in Zoho Books should match the email ID of the customer in GoCardless. Only active mandates in GoCardless will be fetched. For customers to pay via GoCardless in the client portal, you need to enable the Allow customer to pay via Direct Debit option in the contact edit page. Navigate to the Online Payments tab and click the GoCardless. Click on the Initiate Sync option. Navigate to the Online Payments tab and click the Reconciliation button under GoCardless. In the following page, click Configure Bank Accounts. You can map your bank accounts in which you receive payments from GoCardless. This account tracks the fees charged by GoCardless for the transactions processed through their payment gateway. By default, the label is GoCardless Fees. This account will be of type Expense. This account tracks the total sales that happened through GoCardless transactions on your GoCardless account. By default, the sales account is selected. This account will be of type Income. The GoCardless clearing account in the Banking module will give you insights on the transactions that happened on a daily basis. You can easily have a clear picture of the consolidated sales that happened, the fees GoCardless has charged for the transactions, refunds if any and the amount transferred to your bank account by GoCardless. If there are any pending amount that GoCardless owes you, it will be shown as Amount in Zoho Books on the main tab. Sales without Invoices Total amount of previous day’s consolidated sales processed through your GoCardless account. GoCardless Fees The fees GoCardless charges for every transaction processed through their service. Transfer Fund The amount GoCardless deposits in your bank account. Customer Payment The amount received for the invoices sent via Zoho Books. You can edit the accounts configured with GoCardless or choose to disable the GoCardless feeds. Navigate to the Online Payments tab. Click the Transaction History button and you will be redirected to GoCardless where all your transactions will be listed. Click the Remove button to disable the integration. Your clients can view a list of invoices sent by you in the portal. If the invoice is unpaid, they can choose to pay instantly by clicking on Pay Now. In the following page, they need to choose the Direct Debit option and click PROCEED TO PAYMENT. Note: Customers can also choose to save their account details for future transactions by checking the Use this Direct Debit mandate for future transactions option. They’ll be redirected to the GoCardless payment page, where they need to enter their account details and initiate the Direct Debit process. The next time your customer wants to pay for an invoice, he can either pay using an already saved account or use another account. The online transaction fees will depend upon the charges specified by GoCardless.